The Kubota RV diesel generator delivers exceptional power from Kubota’s own D902 diesel engine. Compact, reliable and innovative, the GL14000 is ideally suited for a wide array of applications. As one of the most trusted names in the business, you will not be disappointed when buying a Kubota RV diesel generator. 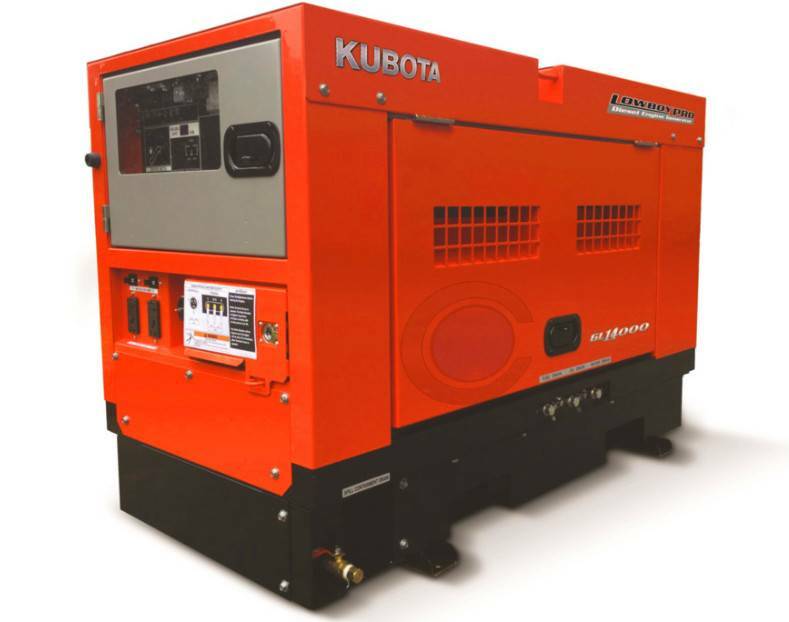 Check out all of our Kubota generators for sale at Colorado Standby. We offer fast and free shipping on all products. Direct engine coupling and unique cooling system enhance the GL14000’s low profile that allows it to fit in more spaces. All maintenance locations can be accessed from a single, large access panel on the side of the generator: oil gauge, oil filter, oil fill, fuel filter, water tank, battery and air cleaner. Engine oil and coolant drain extensions are included to help with regularly scheduled fluid changes. The LowboyPro includes numerous features that reduce overall noise levels. • The large-capacity radiator reduces fan-related noise by direct coupling the crankshaft with a slower-speed fan. • The large-capacity, built-in muffler reduces exhaust noise. • A longer air-cleaner hose dampens air-suction noise levels. • The inlet vent is strategically placed and specifically designed to allow minimal noise from the enclosure’s opening. • Electrodeposition coating covers the edges uniformly, which provides corrosion prevention that is difficult to achieve with other technologies. • Electrodeposition provides an excellent base coat for the exterior powder coat. • External powder coat provides a hard finish that further resists corrosion and maintains its appearance in severe working conditions. The new GL14000 alternator is optimized to generate more magnetic force with fewer turns, which improves long-term reliability and durability. 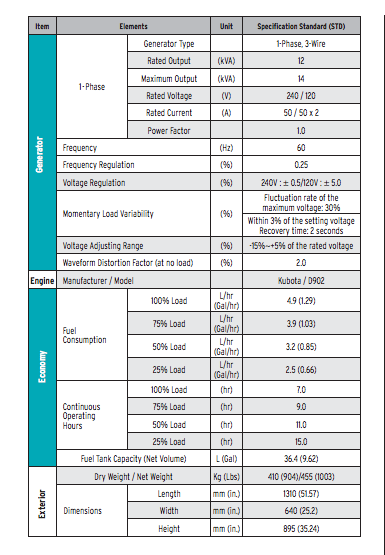 Numerous alternator features help to increase durability and enhance performance. • Varnishing bundles individual coils together within the interior winding layer, greatly improving durability. • The surface of the coil layer is coated with a second layer of varnish to protect against dust and moisture. • The varnish-coated wires are wound at a constant pitch, increasing protection against the wear and ear inherent in high-speed rotation components. • The entire alternator is finish-coated with another varnish layer that enhances moisture and water resistance while ensuring excellent performance in extreme weather.